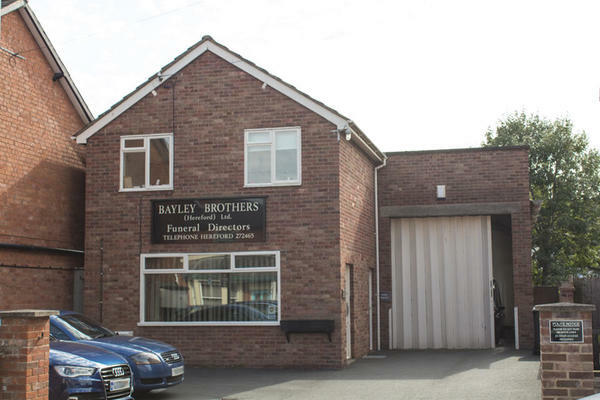 We are Bayley Brothers Funeral Directors in Hereford and you can trust us to care for you and your loved one. You can get a true reflection of how we treat all our families by reading our reviews. Whilst offering you a standard of funeral care that is second none, we consider it our duty to look after your every need. We will work with you to tailor your loved one’s farewell to make it unique and special. You have control over every aspect of the funeral, no matter how different your preference is. The simpler things you can choose are the music, hymns, transport or time and date; or if you would prefer we can arrange everything. The one thing we can guarantee is that your loved one will have a send off that matches your every wish. Since being established in the 1930s, we have gained valuable experience in every type of funeral. We have worked closely with families who have favoured traditional, religious, woodland and celebratory ceremonies. We have an open, honest and dedicated team on hand, 24 hours a day to serve you during this difficult time. They are here to provide guidance and assist you in any way they can. Our Simple funeral is available for £1,480 + third party costs, without compromising on the quality of the service that is delivered. Or our Full Service funeral can be tailored just how you wish, whether that be a traditional ceremony or a colourful celebration of life. Call us today on 01432 272465 to talk through your personal requirements. At Bayley Brothers Funeral Directors, we understand how special life is with those that you love. For us, every funeral is unique and personal. We have a service to fulfil every wish, with every detail carried out with the same uncompromising quality of care. From a traditional service, to a colourful woodland burial, your options are limitless with our Full Service Funeral. If you have a little more flexibility when it comes to arrangements, then we can provide a Simple Funeral for a lower cost. There is parking at the front of the funeral home. Cotterell Street can be accessed from White Horse Street or Holmer Street off the A438. Our staff are available 24 hours a day on 01432 272465 if you require our services outside of these hours. Thank you for posting your review online. I am glad we were able to provide you with the support and guidance needed and that all of your wishes and requirements were carried out by the team as you had requested. Calm, dignified and professional, very happy with the service provided ... cannot recommend highly enough. Everyone we met at Bayley Bros provided a first class service, we had no problems with anything. The time that thay had for us was absolutely great nothing was not to much trouble all the way from the first minute we walk through the door and we can call any time afterwards. Very professional and very appropriate for the occasion, couldn't be more helpful, nothing too much trouble. They were kind, caring, efficient and considerate at a very difficult time. Thank you for posting your review online. I am pleased you were so well looked after by our team and that all of the arrangements were carried out to your satisfaction. Everyone at Bayley Brothers did their best to make a difficult situation less stressful; they were kind and considerate throughout. Everything on the day went perfectly to plan. Very kind and thoughtful staff . Not pushy and did all that we asked , Lewis and Ian were exceptional in their dealings with us . Very good ! They had a great deal of empathy and compassion and nothing was too much trouble. They didn't mind me ringing up and asking any questions. Thank you for the comments left as part of your online review. I am glad that we were able to provide you with the care and support needed at this time and that all of the arrangements were carried out to your satisfaction. Excellent thoughtful service from all of the staff making a difficult day pass as well as could be expected. Very good continuing aftercare especially from Lewis who is deserving of an individual note of thanks. Staff ensured everything went smoothly from start to finish. This is my second funeral with Bayley Bros this year, the first during ‘the beast from the East’, nothing was too much trouble. Great communication with Ian and the team ensured a good send off. Bayley Brothers were caring, thoughtful and extremely professional. Every small detail that I mentioned was noted and carried out enabling me to give my mother the funeral she would have wanted. I found that the funeral personnel handled my husband's funeral with care and understanding and were ready and willing to help in any way to make the occasion are worry free as possible. They attended to ever detail and we were very grateful for their concern. Thank you for the kind comments posted on your online review. I am glad that we were able to provide you with the care and support needed at this time and that we were able to help ease any worries that you may have had. Bayley Brothers in Hereford conducted my mother's funeral a few weeks ago. They were compassionate, efficient, helpful and excellent in every way. The funeral went ahead perfectly with reverence and efficiency. I would thoroughly recommend Bayley Brothers. Our main contact with them was Lewis who was excellent. Paul and John also but they had a smaller role. I have no hesitation in recommending them. Five star service. The staff were very caring in their approach to the family. The information provided was very comprehensive and time given to make choices that were right for us. The service proceeded as requested and was very much appreciated. I would not hesitate to recommend Bayley Brothers Funeral Directors. Thank you for sharing your experience with us on your online review. I am pleased that you were so well looked after by our team and that we provided the highest level of care and guidance to you and your family. Obviously it's a very difficult time .But everything went smoothly and Bayley Brothers were fantastic throughout the process . Thank you for sharing your experience with us on your online review. I am glad we were able to provide you with the support and guidance needed at this difficult time.